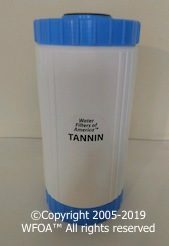 Tannin water filter for tannin removal for drinking only, or whole house tannin removal. First of all, Tannin water filters are sometimes necessary. Because tannins are a natural organic material that can be the byproducts of nature's fermentation process. And Tannins can be created as water passes through peaty soil. And in decaying vegetation. So it can cause water to have a faint yellow to tea-like color. And can cause yellow staining on fabrics, fixtures, china and laundry. So this is why we need Tannin removal water filters. And Tannin water treatment systems and filtration devices come in several different types and sizes. Also, on this page you will see the normal types of tannin water filtration systems. And we also list prices for buying a Tannin Water Filter. So remember that we are factory direct to the consumer. And every Tannin Water Filter is made fresh from scratch. So we have "American Made" water filters of every kind that you could possibly imagine. Also we make them easy to install for the DIY homeowner. So don't be afraid to do it yourself. Does your water look like this? PLEASE NOTE: Some people do not actually have tannins. So if your water is completely clear when you draw it from your faucet or tap, you do not have a Tannin "PROBLEM". And now you may still have tannins. But unless you see color in the water, it is normally not a problem. So often we see some in-home salespeople. And aggressive online filter dealers, use that word to confuse people. But if you are not sure whether you have tannins or not. Just give one of our friendly water techs a call. And he will simply tell you how to do a quick home check for tannins. Also, it is really easy to do. And does not cost anything. So be very wary of people that come into your home, to supposedly test your water. And if they tell you that you have tannins. And have not done a tannins test. Be very careful with what you believe. And some water filter sales people tell you that you have tannins anytime they see any color to the water at all. But only about one in 20 wells that we see with yellow, brown, orange, or red water, have any tannins at all. And even in the image of three glasses above, the color alone would not indicate a certainty of tannins in your water. 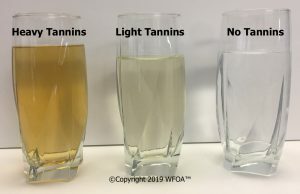 Tannin only: Tannin removal filters to remove Tannins Only from drinking water. And the most common use for these filters is to treat drinking water at the kitchen sink or fridge. Tannin Selective Reverse Osmosis: Also, our Tannin removal water filters remove virtually all of the other unwanted contaminants from your drinking water, as well as the tannins in your water. So it will be bottled water or better quality. Whole House Automatic Backwashing Filters: These filters are virtually maintenance free. And can remove massive amounts of tannins from your water. Consequently, these are our most popular Tannin Removal Filters by far. Because they remove virtually all of the tannins from the whole house. And they are easy to install using our quick connect system. So just about anyone can do it! 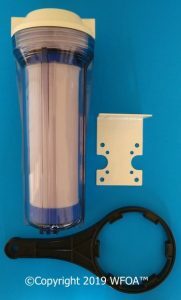 How to Buy a Tannin Water Filter? Below you will see the different types of Tannin Water Filter choices and their prices. And after the products, you will see instructions for getting the correct filter for your needs. These Tannin cartridge filters can be used in its own individual canister. And as a filter that is inserted into a reverse osmosis unit. So that it will remove all of the tannins from the water. And keep in mind, it removes tannins only. And the filter is the industry standard American Made size of 10"x 2.75". Also, it fits most 10" canisters and reverse osmosis systems. 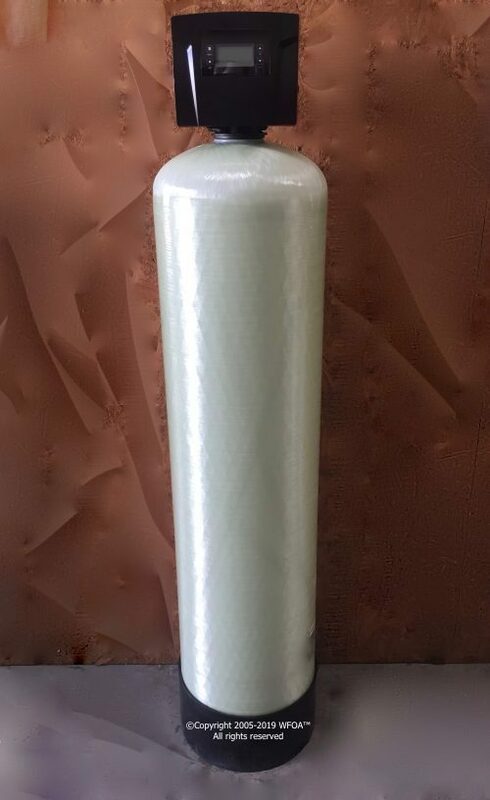 This inexpensive 10 inch tannin filter cartridge can be used by itself to filter tannins from drinking water. It is the industry standard size of 10" x 2.75". We also have most other standard sizes. Just call and speak with a friendly water tech for assistance with the many choices. We can make you anything you want. We have larger canisters for the whole house. And we have large tanks that backwash for whole house tannin systems as well. Questions? Call 800-684-0979 for assistance. Most importantly, reverse osmosis (RO) is the most popular tannin water filter to remove tannins from well or city water that is used for drinking. So we have two basic reverse osmosis options for tannin removal below. Also, these RO Systems remove many other contaminants. Also, it removes lead, bacteria, chemicals, salt, sodium, dirt, contaminants, bad taste and odor just to name a few. So if you want to remove moderate to high levels of tannins from just your drinking water, we would recommend that you use the 5 stage reverse osmosis system with a tannin cartridge added ($278.87). And if the tannins are very light, the standard RO unit should be ok ($219.87). Read more about about Reverse Osmosis systems. First of all, Tannins are removed from the whole house or dwelling by this large backwashing tannin water filter system. And there is virtually no maintenance for many years in most cases where tannin are present. Also, this unit uses no salt, chemicals or cartridge type filter changes. Most noteworthy, we custom make every tannin water filter to order. So the filter does not always look exactly like the picture displayed. Almost always, you should test for pH BEFORE you buy any filters from anyone. And remember that we do basic well water testing for free. So just give a friendly water tech a quick call at 800-684-0979. And we will provide instructions on how to get us a sample. Also, it is a good idea to check pH AFTER installing any tannin water filter. And after any reverse osmosis system. And we also test water for Tannins. But there is a small cost for the Tannins test. And it is a certified lab test in all 50 states. So you can see the link to order the Tannin Water Test below. First of all, Tannin is tasteless and odorless. Therefore the water needs to be analyzed to detect contamination. Also, tannin is very easily dissolved in water, which makes it difficult to remove unless you have a specific tannin water filter. Additionally, drinking water high in tannin may be harmful to humans and animals, especially infants and the elderly. And Tannin contamination can occur in well water due to improper construction. Also, overuse of fertilizers or improper disposal of human and animal waste. So if you have any questions regarding a tannin water filter, email us or call us anytime! Also, tannins can cause a faint yellow to brown color when present in water. And they are usually formed from the decomposition of vegetative matter. And can be quite common in well water and ground water sources such as springs and cisterns. So they can clog filters and cause taste and odor issues with your water. And you might test for tannins before you buy a tannin water filter. So you can talk to one of our friendly water techs about a simple and free in house method to check for tannins in your home.